Spring is a great time to introduce the butterfly life cycle to kids! Wikki Stix is the perfect sensory material for creating a 3-D version of the life cycle. The extra sensory layer provided by Wikki Stix will help the children retain the information long after the craft has been made! 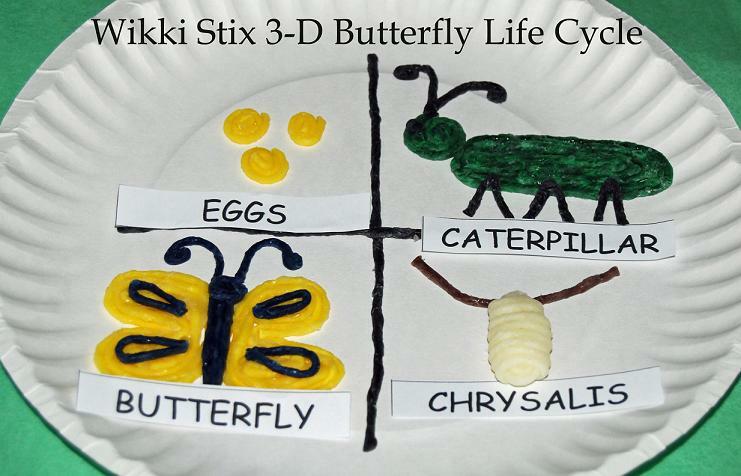 Materials needed: Assorted colors of Wikki Stix, one paper plate per craft, scissors, and the printable labels – download the Life Cycle of a Butterfly pdf file here. Invite the children to use Wikki Stix to divide the paper plate into 4 sections (as in the photo above). Print the Life Cycle of a Butterfly labels (linked above) and have the children cut the 4 labels apart (Eggs, Caterpillar, Chrysalis, and Butterfly). Explain to the children that there are 4 separate stages to the butterfly’s life cycle. The Eggs – the female butterfly lays eggs and attaches them to leaves. The Caterpillar – the worm-like stage of the butterfly is the caterpillar. The caterpillar eats leaves and grows. Butterfly – the butterfly then emerges from the pupa and the life cycle starts all over again. After discussing the 4 Stages of a Butterfly, have the children make small Wikki Stix spirals (eggs) and place them in top (left corner) of the paper plate. The children can then place the EGGS label in that section as in the photo above. In the right corner (top): Have the children use Wikki Stix to make a shape that resembles the caterpillar. Remember there is no wrong or right way to create with Wikki Stix. Older children will create differently than younger children. The goal is to invite younger children to develop and enhance fine motor skills through creating with Wikki Stix. As an added benefit, younger children will retain information for a longer period of time when given the opportunity to CREATE using sensory materials like Wikki Stix. 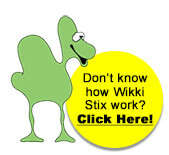 The children can add legs or antennae with the Wikki Stix, if desired. Have the children place the CATERPILLAR label in that section. In the lower right corner: The chrysalis stage can be made using white or yellow Wikki Stix. The children can make a simple oval shape or a more complex shape (as age appropriate). The CHRYSALIS label can then be place in that section. The final stage of the life cycle, the BUTTERFLY, is placed in the lower left corner. The butterfly can be made from two strands of Wikki Stix formed into heart shapes (with the point of the hearts toward the center). The children might also wish to cut Wikki Stix to create the body and antennae. When finished creating the butterfly, the children can place the BUTTERFLY label in that section. Learning about the butterfly life cycle is fun and exciting for kids! As the children play and explore in nature, they can begin to look for eggs on leaves, find caterpillars, and wonder at the beauty of butterfly!